Supraspinatus Injury Information specifically, as this will provide the best coverage and most comfortable fit. Normally, to increase your blood flow, you need to exercise or do other physical activity regularly. For someone who has been recently injured, though, this is dangerous! Re-injury is a very real problem, and if you re-injure yourself you are set back to where you started. Once the inflammation and pain have subsided, stretching and strength building exercises can help increase flexibility and stability in the rotator cuff and supraspinatus. Over time the supraspinatus will be less prone to be pinched between the arm and shoulder bones. Make sure that you do not start physiotherapy too soon in the healing process, or further pain and re-injury will occur. Using a device to stimulate optimal blood flow, however, has almost no risk of re-injury compared to physical activity and exercises. Blood flow stimulation therapy can be used as a safe, effective means of improving circulation, with no effort required. You can stay completely at rest while using the device. Depending on the severity of the injury, and the extent of the treatment, generally it can take from 2 to 12 weeks to heal. With maintaining optimal blood flow and keeping up with a proper physical therapy schedule, your recovery time can be greatly reduced. Painkillers such as NSAIDs (non-steroidal anti-inflammatory drugs) and analgesics can be used to relieve the pain of your Supraspinatus Tear. Just make sure you restrict the use of painkillers to times when you're at rest. Using painkillers when you're active can cause you to feel a false sense of ability. All too often this results in re-injury and a much longer recovery time. NSAIDs such as Aleve (naproxen) and Advil (ibuprofen) help to alleviate pain as well as swelling, whereas analgesics (Tylenol) are only designed to relieve pain. 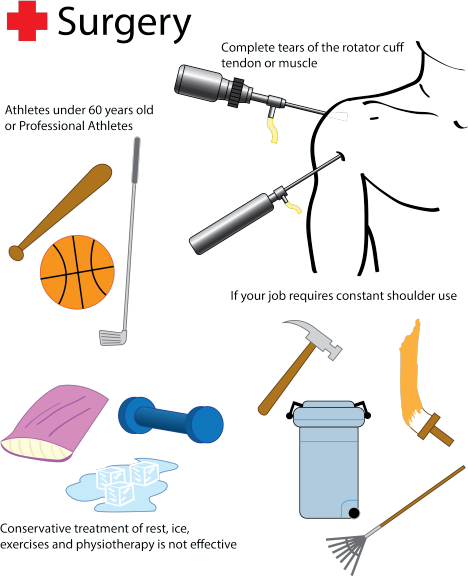 Injecting steroids such as cortisone into your Supraspinatus can work to temporarily relieve the pain and inflammation, however, it won't do anything to heal the tear. Cortisone shots come with a variety of risks and side effects, such as skin discoloration, bone death and tendon rupture. That's why it's recommended that you don't have any more than 3-4 cortisone shots into an area of your body over the course of a year. Because the shoulder joint has a large range of motion it is common that a rotator cuff muscle or tendon can tear through overstretching or rapid twisting of the joint. Tendonitis and tendonosis are other common ailments with the supraspinatus tendon. When the supraspinatus is overworked, pain may occur in the middle of the shoulder. Occupational stresses that can cause supraspinatus injuries are working for prolonged periods of time with your arms over your head. Using your arm to break a fall or falling on your arm can bruise or tear a rotator cuff tendon or muscle. Lifting an object that's too heavy or doing so improperly -- especially overhead -- can strain or tear your tendons or muscles. Repetitive overhead movement of your arms can stress your rotator cuff muscles and tendons, causing inflammation and eventually tearing. An overgrowth of bone can occur on a part of the shoulder blade that protrudes over the rotator cuff. This extra bone can irritate and damage the tendon. Supraspinatus Bursitis is known as 'Subacromial Bursitis' and is a condition caused by inflammation of the bursa that separates the supraspinatus tendon from the overlying ligament as well as the surface of the deltoid muscle. This subacromial bursa helps with the motion of the supraspinatus tendon of the rotator cuff in activities that would require you to lift your hands above your head. As with all inflammation based injuries, it's recommended to follow the rice method found in the Treatment Options section of this page. Taping your supraspinatus can help to provide the damaged tissues with extra support and protection while you heal. It's also an effective way to prevent re-injury. You can wear the tape any time, but it's particularly important during physical activity. Tape works to limit the movement of your injured tissue. By keeping the tissue in place, this reduces the risk of further injury during movement. Athletic tape (which is also known as sports tape or kinesiology tape) is growing in popularity amongst professional and amateur athletes, as well as doctorts, coaches and physiotherapists. We recommend that you do some research online to find the tape application that works best for your supraspinatus injury. There are many resources out there with instructions and videos to help you with the applications. Something to keep in mind: make sure you are taping over the area that is painful, as this indicates which area of your shoulder has been injured. 1. Take one full length piece of tape (about 10 inches) and tear the backing off one end. 2. Anchor the tape just below the bone that protrudes from the side of your shoulder, using no stretch. 3. Pull the tape towards the back of your shoulder using 25% stretch, going just below where the top of the shoulder blade protrudes. 4. Lay the end of the tape down with no stretch. 5. Take another full length piece of tape and cut it in half, rounding the corners, so you have two pieces that are each about 5 inches long. 6. Take one of the 5 inch strips and tear the backing in the middle, peeling it away so you are holding onto the two anchor ends. 7. Apply the strip of tape vertically along the side of your shoulder, using 80% stretch in the middle and no stretch at the ends. 8. Apply the other 5 inch strip vertically right beside the one you just applied, but closer to your shoulder blade, using 80% stretch in the middle and no stretch at the ends. 9. Rub the tape in to make sure it sticks. Supraspinatus tendonitis is a common source of shoulder pain in athletes that participate in overhead sports (volleyball, tennis, baseball, football, etc.) This is in most cases caused by an impingement of the supraspinatus tendon on the acromion as it passes between the acromion and the humeral head. Pain and a decrease in range of motion, strength and functionality are the main complaints that accompany this injury and should be addressed. While healing the supraspinatus is important, continuing range of motion exercises should be outlined as well to enable the full recovery process. The goals of the acute phase are to relieve pain and inflammation, prevent muscle atrophy without intensifying the pain, and to re-establish non-painful range of motion. To help reduce inflammation the RICE method should be applied. Rest, Ice, Compression, Elevation. Along with the RICE method, optimal blood flow should be generated to help bring nutrient rich oxygenated blood to the area of injury. The supraspinatus and infraspinatus are two of the four muscles that make up the rotator cuff. The infraspinatus muscle is in charge of shoulder external rotation, and the supraspinatus muscle is in charge of shoulder abduction. Both muscles are prone to injury and require strengthening. 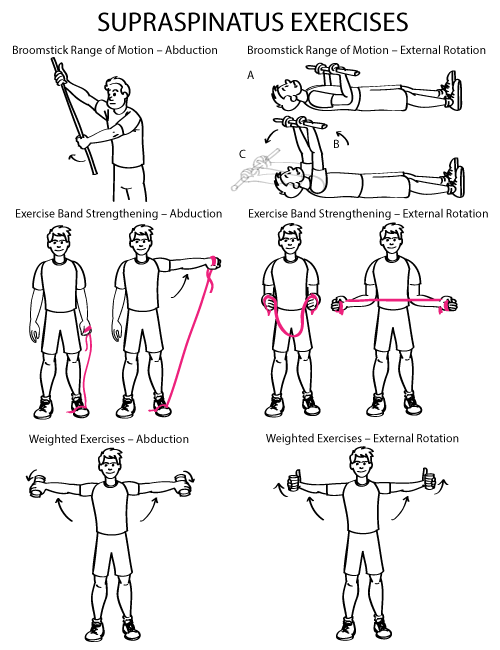 If injury has occurred to the supraspinatus tendon, please do not do any of these exercises until the injury has healed itself. When working on these exercises, know that pain is a sign of injury. If pain is felt, please stop these exercises and ice the injured area to reduce inflammation. Hold the broomstick with the hand of your injured arm, palm up. Push the wand directly out to your side. Guide with the other hand palm down until a stretch is felt. Lie on your back holding the broomstick in both hands with your elbows bent to 90 degrees. Rotate your arms overhead as far as possible. Stand with one end of the band under your foot and the other end in your hand. Keep your elbow straight and raise your arm to shoulder level, out to the side. Stand with the band in both hands. Keep elbows at your sides and bent at 90 degrees with your forearms facing forward. Pinch your shoulder blades together and rotate your forearms out. Hold light weights and straighten the elbow and point your thumb down. Raise your arm diagonally from the hip to just below the shoulder height. Hold light weight, straighten the elbow and point your thumb up. Raise your arm diagonally from the hip to above the head. Symptoms of a torn supraspinatus tendon will usually consist of sudden pain in the shoulder some accompanied by a tearing feeling. This can be severe and may transmit down into the arm. 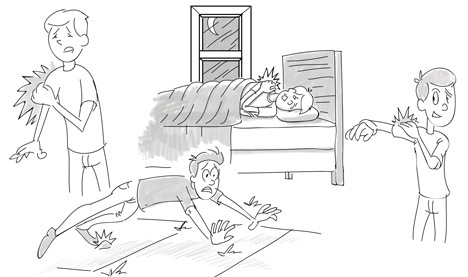 Having the inability to sleep on the injured shoulder and signs of impingement where the tendon pinches between the ball and socket of the shoulder joint when moving the arm out over the height of the head. Pain can gradually get worse over time and eventually weakness in the shoulder will occur to the point where the athlete is unable to lift their arm up to the side. Overhead movements such as racket sports become very difficult. The therapist will examine the shoulder, looking for swelling, bruising, muscle wasting, postural issues etc. It is important that the injured side is compared to the unaffected side at all times. The therapist will test the range of motion at the shoulder, both actively (the patient moves themselves) and passively (the therapist moves the arm and the patient relaxes). This should always be compared to the uninjured side for what is normal for each individual. The therapist will ask you to move your shoulder against resistance (usually provided by them pushing against you). Weakness compared to the uninjured side or pain during shoulder rotation or abduction indicates a rotator cuff injury. You will be asked to put your arm out in front of you at a 45 degree angle to your body, with the thumb pointing to the floor (as if holding an empty can). The therapist will ask you to raise your arm while they resist your movement. This tests the supraspinatus tendon directly. Your arm will be moved above your head, and you're asked to gently lower your arm to your side. If you can't do this slowly and under control, or have severe pain in doing so, it suggests a tear in the rotator cuff, specifically the supraspinatus. You will be asked to sit and raise your arm to your side with the elbow bent. You will be asked to rotate your arm forwards and backwards. If there is any crunching noise (crepitus) there may be some inflammation or degenerative changes. The therapist will position your arm with the thumb facing down and at a 45 degree angle to your body. They will then lift your arm up, above your head. If you experience pain or discomfort, you may have an impingement of the supraspinatus muscle. Your arm will be raised in front of you to 90 degree and the elbow bent. The therapist will then medially rotate (turn the wrist down and elbow up) the arm. If this causes pain you probably have an impingement of the supraspinatus muscle. Shoulder impingement syndrome is a common cause of shoulder pain. It occurs when there is impingement of tendons or bursa in the shoulder from bones of the shoulder. Overhead activity of the shoulder, especially repeated activity, is a risk factor for shoulder impingement syndrome. 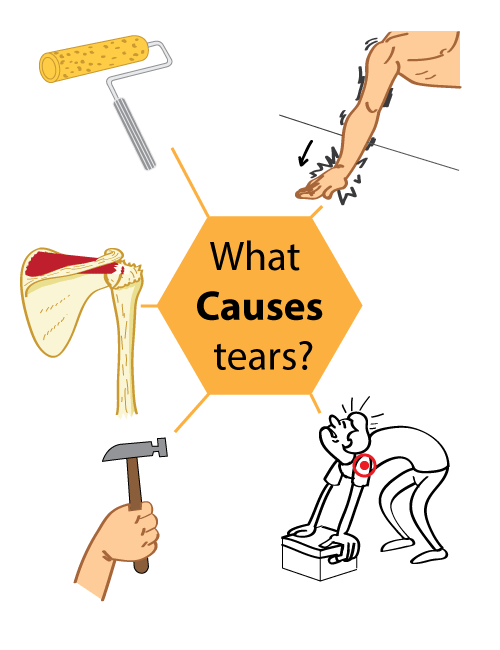 With impingement syndrome, pain is persistent and affects everyday activities. Motions such as reaching up behind the back or reaching up overhead to put on a coat or blouse may cause pain. Over time, impingement syndrome can lead to inflammation of the rotator cuff tendons and bursa. If not treated appropriately, the rotator cuff tendons can start to thin and tear. 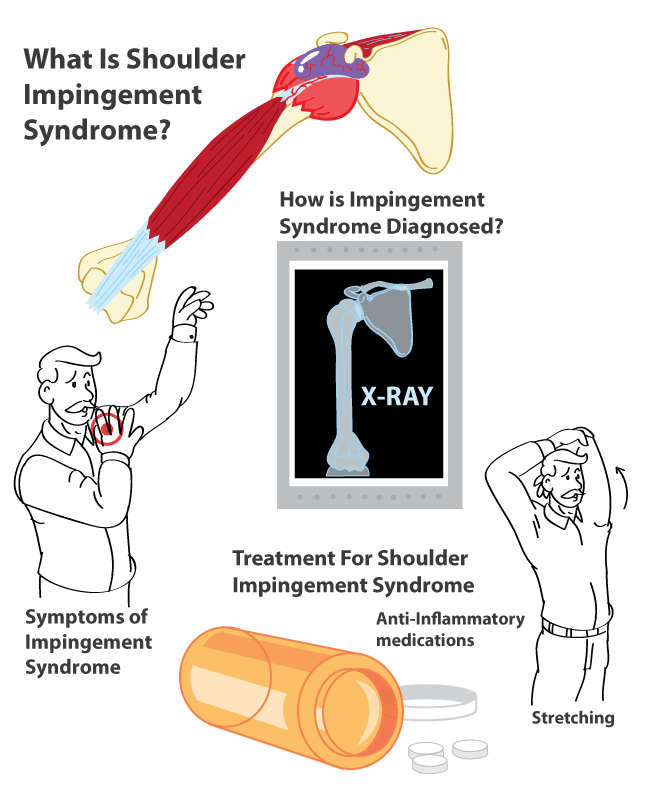 The typical symptoms of impingement syndrome include difficulty reaching up behind your back, pain when lifting your arm above your head and weakness of the shoulder muscles. If the tendons are injured for a long period of time, the tendon can actually tear in two, resulting in a rotator cuff tear. 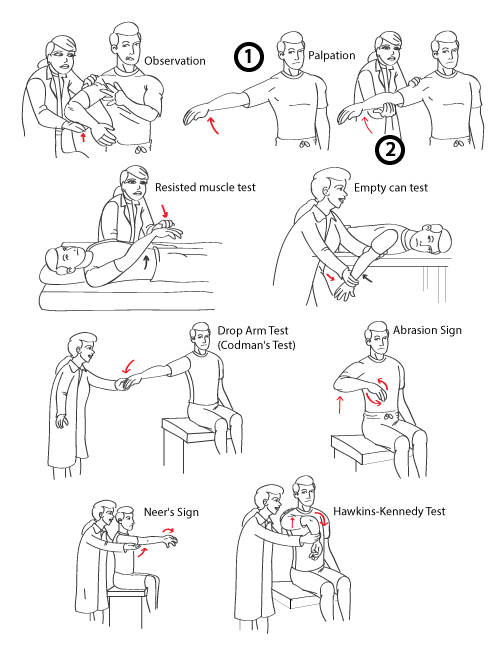 This causes significant weakness and may make it difficult for you to lift your arm. Some people, if left untreated, will experience a rupture in the biceps muscle. X-rays will be taken to rule out arthritis as the symptoms are very similar. Images may show changes in the bone that indicate injury of the muscle or tendon. Bone spurs or changes in the normal contour of the bone may be present. Anti-inflammatory medications such as aspirin, naproxen or ibuprofen are the most common treatment to help relieve the symptoms of impingement syndrome. Medications are usually prescribed for six to eight weeks, as this is the common length it takes to treat impingement syndrome. In addition to medications, daily stretching in a warm shower will help. Work on reaching your thumb up and behind your back. Avoid repetitive activities where the elbow would move to shoulder level. If symptoms persist or if significant weakness is present, then your doctor may perform an ultrasound or MRI to rule out a rotator cuff tear. Most people who suffer from impingement syndrome are successfully treated with medication, stretching exercises and avoidance of repetitive overhead activity until the condition settles down. Recovery time for a rotator injury will vary depending on several factors. Conservative treatment has a 40-90% success rate at fixing the problem. Surgery often has good results, with some studies citing a 94% satisfaction rate with the surgery, resulting in lasting pain relief and improved function. Very extensive tears often have a poor surgical outcome; however this injury is thankfully quite rare. If you are older, it will take longer to heal.